Not all fishing boats are designed to handle a bow mount trolling motor. In a lot of cases, a transom mount is your best option. A lot of readers have probably run into the issue of not being able to find a reliable transom mount that offers a lot of the features of some of the higher end bow mounts. We think the Minn Kota Endura Max might be a solution for you. In this article, we will take an in-depth look at the Minn Kota Endura Max trolling motor. We will break down the model options, features, and how it all translates to performance on the water. Overall, we give the Endura Max an A- rating. Throughout the review, we hope to make it clear as to why we think the Endura is an excellent option for your transom mount electric motor needs. In this section, we are going to take a look at the main features that have been built into the Minn Kota Endura Max trolling motor. In the review section, we will discuss in more detail how these features translate to functionality while on the water. The hand tiller on the Endura Max can extend up to six inches giving you more versatility in positioning and handling of the motor on your boat. The Endura Max is a unique transom mount in regards to its speed control. It uses a digital variable system which means there are not set speeds that you are limited to. Instead, you can dial in the exact amount of speed that you need. The Endura Max’s quick release mount has a ten-point position bracket that is made from a durable composite material. Sitting on top of the control head, the Endura Max uses a four-point LED light battery meter that allows you to keep track of remaining battery life. All models of the Endura Max comes with the Minn Kota Power Prop. This is a classic two blade design prop designed to work through light to medium underwater growth. Like all of Minn Kota’s trolling motors, the Endura Max features a composite shaft that comes with a lifetime warranty. The composite shaft is designed to take abuse, even tremendous stress without breaking or warping. Minn Kota has put a lot into the design of their motors to maximize its efficiency. With large winding and commutators and a quality bearing system, heat is dissipated rapidly which improves the battery life as well as the quietness of the motor. There are several accessories that can be bought separately from the trolling motor as well as some available replacement parts. We have listed those items below. MK 110PD: Portable marine battery. One ten amp bank is available. Battery Power Center: Waterproof box for your marine battery. MKP-32 Weedless Wedge 2 Prop: A different prop design that is compatible with the Endura Max trolling motor. MKR-12 Quick Connector Plug: Wiring adapter where a plug and socket can't be used. There are a few different models of the Minn Kota Endura Max trolling motor line. All of the models come with the same mounting bracket, Power Prop, and battery meter. The only difference is going to be in the amount of max thrust as well as the shaft length. We did note in the features sections that this trolling motor is compatible with the Weedless Wedge 2 prop and can be bought and installed separately from the unit. One of the best features of the Minn Kota Endura Max and its versatility in mounting is that it makes it an excellent option for use on smaller vessels such as personal kayaks or pontoons. The smaller thrust options also make it a great option for this type of use. You might run across some other sources that complain about rattling of the whole unit, especially when running on higher speed settings. We have come across those as well, and while we have not seen any such issues, you should consider everything, you also have to consider that they did not have the motor mounted correctly. The motor comes with a 10-position bracket with dual mounting bolts. It also features a quick release lever which is nice for those who do not leave the motor mounted out of the water or if you need to get the motor off quickly. The two bracket bolts have large wingtip handles on the end that gives you a good grip and leverage for tightening up the bracket to the transom or other area of the boat. As far as deploying goes, it features an easy to use depth adjustment collar and the lever release allows you to easily maneuver the trolling motor between it’s ten placement settings. Not only does this come in handy when mounted on the transom, but the change in motor angle allows you to use this motor with smaller boat that might not have a transom. Stowing and deploying is smooth and quiet when mounted properly. If you do not have a good base for mounting, it can feel wobbly and be quite noisy, but we don't think it has anything to do with the design or construction of the motor itself. With any trolling motor regardless of the size or the amount of use it is going to see, you want it to see durability. We think that the Endura Max provided the needed durability that any trolling motor user will be thankful for. The most obvious design element of the Endura Max, regarding the durability, is the Minn Kota composite shaft. This is the same shaft that is found on all Minn Kota trolling motors and provides an incredibly strong and warp resistant link between the control and motorhead. The shaft is made from a composite material that has several advantages to a material such as stainless steel. The main advantage is that this composite material has more bend than a steel material. This ability to bend but not break helps protect the motor and your boat on the chance you do run into a larger underwater structure. This type of material also resists warping which will negatively impact the control of the motorhead and your ability to direct the boat. The mounting bracket along with the control head is also made from a high impact resistant composite material. It’s tough but lightweight and will resist flexing, warping, and UV damage over time. Perhaps the only issue that we have with the hand tiller for the Endura Max is that it cannot tilt to different angles coming from the head of the motor. We think that ability makes it a lot easier for use on smaller boats where you do not have to get into awkward positions. Other than that, the hand tiller it extremely comfortable and more importantly, the speed adjustment has no issues. With it being digital variable it is a little different than other hand tillers you have probably used. You don't have any audible clicks as you adjust to different speed settings. It might take a little while to adjust, but the hand gives you such fine control over the speed of the trolling motor. We also like the hand tiller has visible indicators for forward and reverse directions as well as numbered speed settings just to give you an indicator of where you are at regarding power. With transom mounts, you don’t have the issue of lag that you sometimes find with bow mounted trolling motors that use a foot pedal system for directional and speed control. What a lot of users for a transom mount do look for is the tension between the motor shaft which influences how easy it is to turn the motor With the Endura Max, you can adjust the tightness of the motor and how easy it will be to rotate the motor. Some anglers like it a little looser while others might want shaft and motor held a little tighter to the mount. For speed control, the digital variable speed is a huge plus for the Endura Max. The majority of other trolling motors that mount on the transom have set speed settings. While the set speed controls are perfectly fine, digital variable gives you quite a few advantages. First, you have full control of the motors speed, and most of us want as much control as we can get over our equipment, maybe its an ego thing. Secondly, by dialing in precise speed settings, the motor can draw only as much energy as it needs which leads to more time on the water and better battery life. We have covered most of the important aspects of this trolling motor and its performance on the water. There are a few extra features of the trolling motor that we want to go over before we wrap up this article. As for the prop, we like Minn Kota’s Power Prop. The two-bladed propeller is great for normal use on lakes and rivers. It can handle light and even medium vegetation without getting bogged down and draining a lot of power. It has its limits, but for the size boats it's going to be mounted on it provides more than enough thrust and a design that is going to make getting through weedy undergrowth less of a headache for you. And as we stated earlier, the Weedless Wedge 2 prop is compatible with this trolling motor, so if you have had experience with it and liked its performance, you can easily replace the prop. It's even easy enough for the majority of boat owners to replace it on their own out in the garage. The other major feature of the Endura Max that we have not discussed in any other section is the push-to-test battery meter. This is located on top of the control head in easy view from a maneuvering position. It uses four LED lights that give you a fairly accurate indication of how much battery life you have remaining. It's small but an incredibly useful feature on the motor. Minn Kota has another transom mount trolling motor that is very similar to the Endura Max, and that is the Endura C2. The Endura C2 also has the ten point mounting bracket, so you have the same versatility in mounting. The Endura C2 does not have the digital variable speed as the Max does and it also does not come with a push to test battery meter. The Endura Max can be thought of like a slightly upgraded version of the C2. For a similar trolling motor to the Minn Kota Endura but from a different company, the closest in performance is going to be MotorGuide’s R3 trolling motor. Like the Endura, the R3 is a multi-position bracket mounted transom mount. It is very similar to the Endura Max in thrust options with a 30, 40, 45, and 55lb peak thrust option. The biggest difference between these two models is that the R3 does not have a digital variable speed setting as the Endura Max does. Other than that, both feature an adjustable angle mount and a telescopic hand tiller. 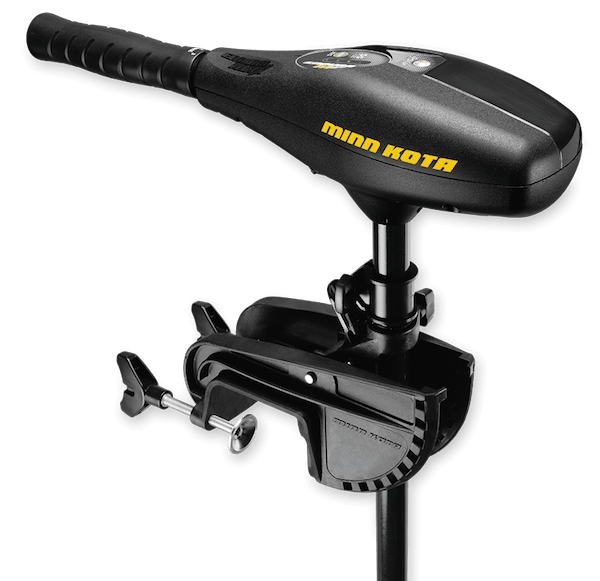 If you are in the market for a transom mount trolling motor that doesn’t sacrifice in performance you might find in bow mount trolling motors of a similar size, the Minn Kota Endura Max fits the bill. You get excellent control over the speed and direction of the prop with the extendable hand tiller, and this motor is incredibly versatile in its mounting options. You also get some added features not usually found on transom mount motors of this size such as the digital variable speed control option and an integrated battery meter. If you have a small fishing vessel or a single/double person watercraft, the Endura Max is a viable option. With limited model options, particularly with the peak thrust, and some common complaints about the vibration that occurs, this trolling motor still gets an A- rating from us at Fishing Tech.